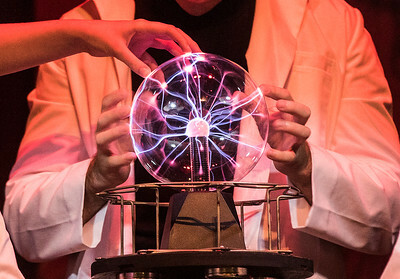 Sarah Nader- snader@shawmedia.com A prop is used during dress rehearsal for The Woodstock Musical Theatre Company's production of Mel Brooks musical "Young Frankenstein" at the Woodstock Opera House Tuesday, September 29, 2015. The show opens on Oct. 2 with performances on Friday, Saturday and Sunday through Oct. 18. Sarah Nader- snader@shawmedia.com Savannah Thomas (left) who plays Elizabeth Benning and Jerry Hage who plays The Monster perform a song during dress rehearsal for The Woodstock Musical Theatre Company's production of Mel Brooks musical "Young Frankenstein" at the Woodstock Opera House Tuesday, September 29, 2015. The show opens on Oct. 2 with performances on Friday, Saturday and Sunday through Oct. 18. 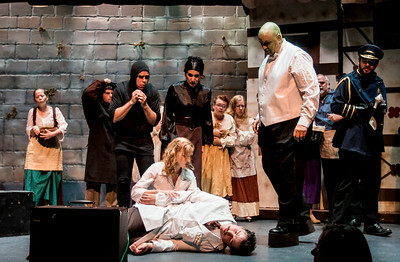 Sarah Nader- snader@shawmedia.com Colin May (left) who plays Dr. Frederick Frankenstein and Jerry Hage who plays The Monster perform a scene during dress rehearsal for The Woodstock Musical Theatre Company's production of Mel Brooks musical "Young Frankenstein" at the Woodstock Opera House Tuesday, September 29, 2015. The show opens on Oct. 2 with performances on Friday, Saturday and Sunday through Oct. 18. Sarah Nader- snader@shawmedia.com The ensemble performs a song during dress rehearsal for The Woodstock Musical Theatre Company's production of Mel Brooks musical "Young Frankenstein" at the Woodstock Opera House Tuesday, September 29, 2015. The show opens on Oct. 2 with performances on Friday, Saturday and Sunday through Oct. 18. 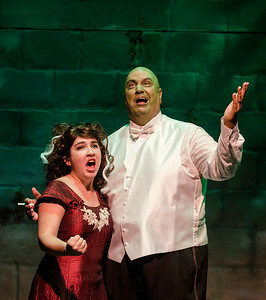 Sarah Nader- snader@shawmedia.com Jerry Hage who plays The Monster performs a song during dress rehearsal for The Woodstock Musical Theatre Company's production of Mel Brooks musical "Young Frankenstein" at the Woodstock Opera House Tuesday, September 29, 2015. The show opens on Oct. 2 with performances on Friday, Saturday and Sunday through Oct. 18. Sarah Nader- snader@shawmedia.com The cast of The Woodstock Musical Theatre Company's production of Mel Brooks musical "Young Frankenstein" rehearse a scene at the Woodstock Opera House Tuesday, September 29, 2015. The show opens on Oct. 2 with performances on Friday, Saturday and Sunday through Oct. 18. 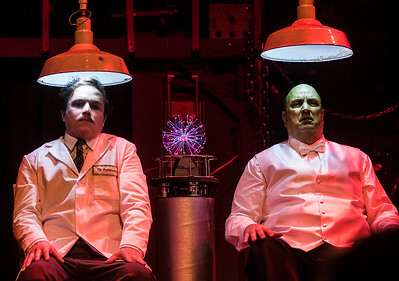 Colin May (left) who plays Dr. Frederick Frankenstein and Jerry Hage who plays The Monster perform a scene during dress rehearsal for The Woodstock Musical Theatre Company's production of Mel Brooks musical "Young Frankenstein" at the Woodstock Opera House Tuesday, September 29, 2015. The show opens on Oct. 2 with performances on Friday, Saturday and Sunday through Oct. 18.